Sullivans Cove Distillery has announced a limited two bottle release of Tasmania’s most expensive whisky to date. Sullivans Cove Manifesto (47.9% ABV) is made from some of the distillery’s rarest and most awarded French oak casks, including French Oak HH0525, which was awarded the title of the World’s Best Single Malt Whisky at the 2014 World Whiskies Awards. Retailing for $10,000 AUD, each 155cl bottle of Sullivans Cove Manifesto, is presented in a decanter that was hand made by Tasmanian glass sculptors Anne Clifton and Peter Bowle. Each 6kg decanter comes with its own specially blown glass spirit thief, a hand moulded travel stopper made from rare Tasmanian Huon pine and Portuguese cork and a matching glass stopper for everyday use. 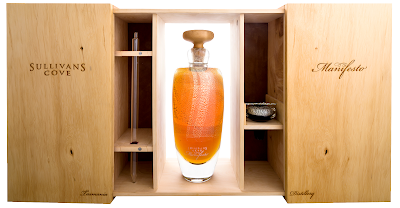 The decanters are housed in hand made Huon pine cases lined with doeskin. Commenting on the release, Bert Cason, Sullivans Cove Marketing Manager, said: "Sullivans Cove and Tasmanian whisky in general have come a very long way and we wanted to create something really special that captures this. Using whisky from our top awarded casks plus some of our finest unreleased casks, we've created a malt that stands head and shoulders above the rest and promises the connoisseur the treat of a lifetime, not to mention a slice of whisky history." One of the Sullivans Cove Manifesto decanters is available directly from the distillery, while the other is available from wine and spirits retailer Dan Murphy's in Double Bay, New South Wales, Australia.